If you have not yet read Part 1: The Great Retirement Con, available free to all readers, please click here to read it first. In Part 1, we revealed the woefully insufficient level of retirement savings -- across IRAs, 401ks, and public pensions --- America faces as it's largest demographic cohort, the Baby Boomers, now reaches retirement age. And eating quickly away at the scant savings that exist is the soaring cost of big-ticket essentials such as rent, higher education and healthcare that retirees can't avoid paying. There are only a few strategies that can make a real difference: own assets and income streams that keep up with real-world inflation, radically reduce the cost structure of big-ticket household expenses, qualify for subsidies (i.e. lower household income), and/or adopt a healthier view of what prosperity in retirement means. 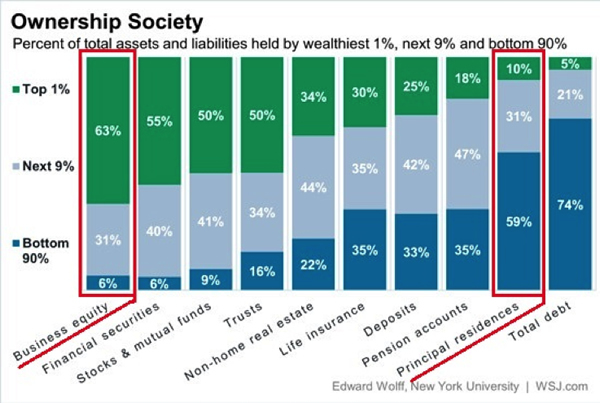 This chart says volumes about the difference between wealthy households and middle-class households: the middle-class households’ primary asset is the family home, while the wealthy households’ primary asset is business equity: ownership of an enterprise or shares in enterprises. Developing a profitable enterprise is easier said than done (it helps to inherit a family business), and there is no guarantee a business that’s successful today will still be successful next year.